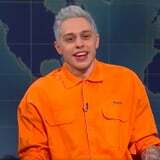 Pete Davidson Talks Ariana Grande Split on SNL: "She's a Wonderful, Strong Person"
It was the portion of Weekend Update everyone was waiting for, and Pete Davidson handled it with nothing but respect for his ex-girlfriend. Just a few hours after Ariana Grande released a song, "Thank U, Next," referencing Pete and their former relationship, the blue-haired comedian spoke during Saturday Night Live's segment about their October split. "I know some of you are curious about the breakup, but the truth is that it's nobody's business and sometimes things just don't work out and that's OK," he said. "She's a wonderful, strong person and I genuinely wish her all the happiness in the world." Pete then encouraged everyone to focus on other things, like voting in midterm elections on Tuesday. Watch the clip above.